For those that want to kick the coffee habit, this quick and easy recipe will give you the energy boost you’re looking for, while improving your mental focus. With healthy, natural ingredients, and a powerful form of vitamin B12 (which can actually outperform caffeine when it comes to boosting energy), this is truly a winning combination. Then, all you do is add the dry ingredients and the B12 to the coconut water, stir it up and enjoy! How does this recipe boost energy? These ingredients have been selected for their abilities to create and direct energy to the right places, to carry you through your day and into the next. This is a drink that boosts your energy without you having to suffer the crash a few hours later. Cocoa helps to encourage weight loss and is great for brain and cardiovascular health. It improves your mood and can contribute to an increase of energy. Sea Salt offers aid to your adrenal glands, so you can get more blood pressure and reduced pressure on the adrenal glands, which helps to create more energy. Cinnamon directs some of the caffeine from the cocoa and lets it affect the brain, which helps to sharpen your cognitive function and focus. Coconut water contains electrolytes, which have an effect on cellular function and blood pressure, as well as stimulating muscles and nerves. They are especially important after a workout. 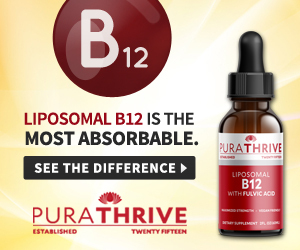 PuraTHRIVE uses a unique Micelle Liposomal delivery method to make sure you’re getting the most out of the supplement you’re taking – you get up to 185x better absorption with this formula than with most other forms.